Sir Peter Scott was one of Britain's best known naturalists but this didn't put him off believing in the Loch Ness Monster. He had such confidence in the monster's existence that he gave it a name. Scott named the monster, using the Ancient Greek language, and settled on Nessiteras rhombopteryx. This is translated loosely as meaning the Ness monster with diamond-shaped fin. Not sure why he couldn't have settled on a Scottish name and neither did the British newspapers at the time. As happens, one of the reporters was into anagrams and played around with Nessie's Greek name. By a coincidence the reporter managed to re-arrange the letters of Nessiteras rhombopteryx to read, Monster Hoax by Sir Peter S.
All of this failed to deter Sir Peter and along with David James MP, and others, they founded the Loch Ness Phenomena Investigation Bureau which was in existence for ten years from 1962 to 1972. 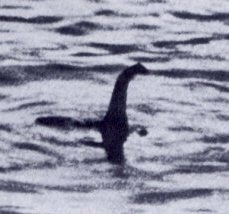 One of the most famous photos of the Loch Ness Monster is the one on this post, supposedly taken by Dr. Robert Wilson way back in 1934. He claimed he was looking at the loch when he saw the monster, grabbed his camera and snapped five photos. After the film was developed, only two exposures were clear. In saying this it is now generally thought that the photo may well be a fake. No clear photos of the monster have ever been published so many agree with that anagram of: Monster Hoax by Sir Peter S. But there again ... there could be a monster, couldn't there? ive always liked to think that there is a loch ness monster. didn't know peter scott supported the idea. strange coincident about the anagram and presume he didnt know this when making up the lnm name as he was a believer and not a hoaxer. Yes, there could be a monster! I've often wondered if collective beliefs in something - a monster, UFOs, whatever - could bring it into existence. Interesting anagram!